Many cat owners battle with when and how to combat litter-box odors, especially ammonia. While many cat litters claim to have bacteria-fighting and odor-control ingredients, a dirty litter box will always give off an odor. 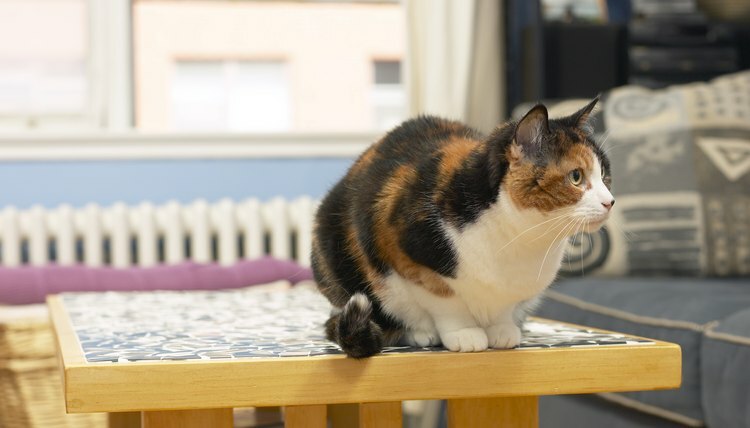 To prevent ammonia odors from creeping from the litter box into the rest of the house, incorporate a daily, as well as weekly, litter-box cleaning routine to maintain a fresh litter box and leave a clean-smelling house. Slide on rubber dishwashing gloves before handling the litter box. Empty the litter box completely into a plastic bag. Rinse dust and debris free from the litter box with clean water. Wash the litter box with warm soapy water and one-fourth cup of bleach. Allow the mixture to sit in the bottom of the litter box for 10 to 15 minutes before rinsing the litter box with warm water. This gives the bleach time to kill the bacteria and remove the ammonia. Turn the litter box upside down on clean newspapers and allow the box to dry for about 10 minutes. Fill the 3-gallon bucket with 2 gallons of water, 1 teaspoon of mild dish detergent and one-fourth cup of bleach. Lather up the hood of the litter box with the sponge, using the mixture of warm water, detergent and bleach. Allow the mixture to remain on the hood for 10 to 15 minutes before rinsing the hood with warm water. Set the litter box hood aside on clean newspapers and allow to dry for about 10 minutes. Dry the litter box and hood with newspapers, starting on the outside of each piece and working your way to the inside, making sure to completely dry the corners as well. Pour 1 to 2 inches of fresh litter into the litter box and replace the litter-box hood. Scoop the litter box daily to remove solid and liquid waste. Wash, rinse and dry the litter box each time you start a new bag of litter to prevent odors completely. Fill an old sock with a hole in the toe with plastic grocery bags and hang it near the litter box to make quick work of daily scooping. Line the litter box with a biodegradable litter box liner to make changing out the litter easier. Unaltered cats are more likely to have a stronger ammonia smell because they also spray ammonia. Pregnant women should never clean a litter box because of toxoplasmosis, a parasitic disease that can infect the fetus and cause the fetus to abort.